Citation Information: J Clin Invest. 2010;120(7):2446-2456. https://doi.org/10.1172/JCI33144. 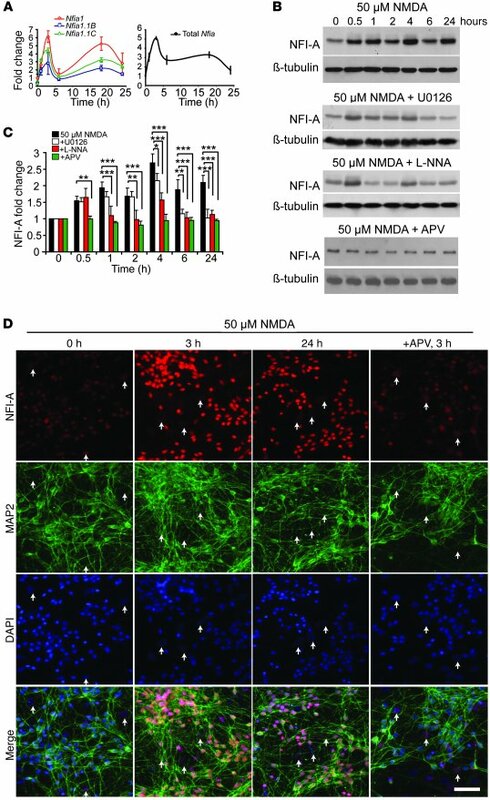 NFI-A is induced by neuroprotective models in vitro. (A) Induction of Nfia mRNA splice variants (left) and total Nfia mRNA (right) upon 50 μM NMDA (5 minutes) treatment in primary cortical cultures. Message levels were measured by quantitative real-time PCR using isoform-specific primer sets. Total Nfia mRNA was measured in at least 3 independent experiments, with mRNA levels normalized relative to Gapdh internal control. (B) Immunoblot analysis of the induction of NFI-A following a 5-minute 50 μM NMDA treatment of primary cortical cultures with or without the MEK inhibitor U0126 (50 μM), the NOS inhibitor nitro-l-arginine (L-NNA, 100 μM), or the NMDA receptor antagonist APV (250 μM) applied 30 minutes before 50 μM NMDA treatment. (C) Quantification of NFI-A levels was normalized to β-tubulin expression. Experiments were replicated at least 3 times; *P < 0.05, **P < 0.01, ***P < 0.001, 1-way ANOVA followed by Tukey-Kramer post-hoc test. (D) Immunocytochemical staining of cortical cultures at 0, 3, and 24 hours after 5-minute 50 μM NMDA treatment shows induction of NFI-A only in neurons (MAP2+), which is blocked by APV (250 μM). Note that the increased intensity of NFI-A staining in MAP2+ cells and staining in non-neuronal cells (arrows) does not change following NMDA treatment. These data are representative of 3 separate experiments. Scale bar: 50 μm.